Regardless of the 663,000 people that signed a petition presented to the Georgia state parole board, numerous dignitaries such as former President Jimmy Carter, Pope Benedict XVI, former FBI Director William Sessions, former Georgia Supreme Court Justice Norman Flectcher and Larry Thompson, the former deputy US attorney general, and Bishop Demond Tutu, the Georgia state parole board has denied clemency for Troy Davis. 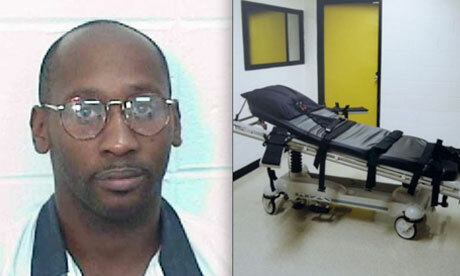 Troy Davis, 42, is scheduled to be put to death by lethal injection tomorrow at 7 p.m. at the state prison in Jackson. Regardless if three former case witnesses are now testifying on Davis' behalf and have signed affidavits asking the board to spare Davis from execution, the board still wants to proceed. The slain cops family wants to proceed, so they can have closure. However, this case has serious doubts and serious questions and no government should be able to take a life when there is doubt in the findings. Executing Davis won't bring the slain officer's family closure. He's not getting out of jail, just his life spared, so why is Georgia's parole board so determined to take Davis' life? Read more (here).